Fenton Asst. from Oct. 1909 Butler Bros. Ad. PRISCILLA Bonbon: This RARE bonbon was seen at a local auction house in Indianapolis. From all appearances it is a vintage example, and the first of its kind that we have seen in our more than 40 years of “the hunt”! 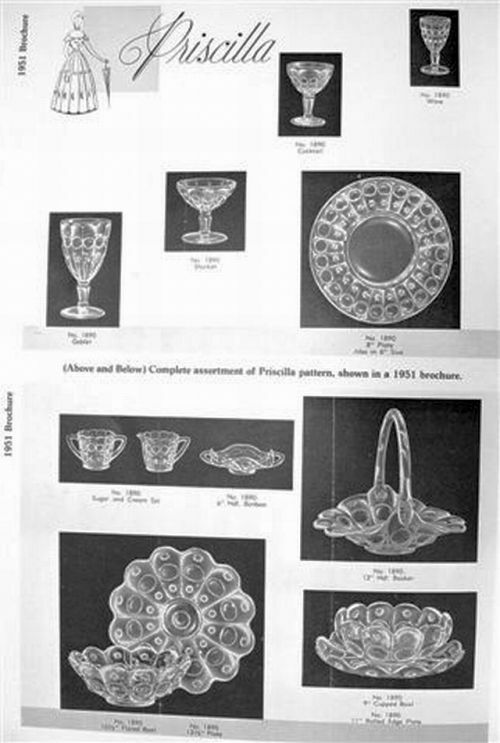 The 1951 ad appears to display crystal examples in various shapes of Priscilla, including the bonbon mold. 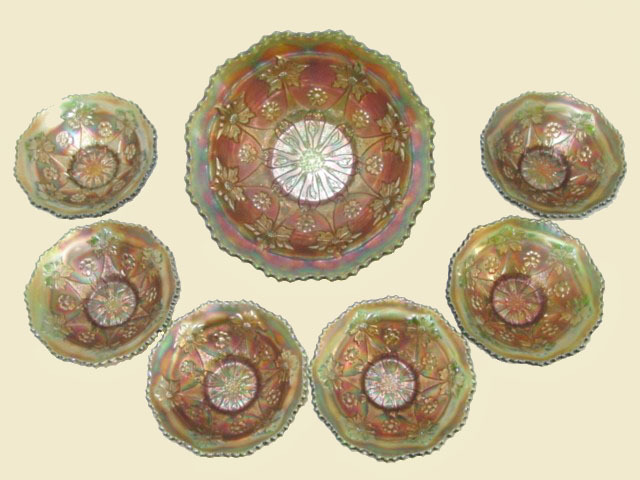 In looking at the 1909 Butler Brothers ad, which offers the very earliest of carnival glass examples to include Honeycomb and Clover, a serious view of the rose-bowl-type in the middle row/right side, lends credence to Priscilla pattern. What do you think? Granted, the design on the piece is somewhat vague, but there IS a resemblance. 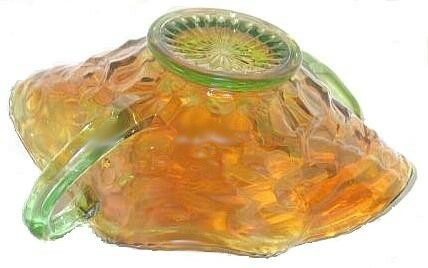 Could original use of that pattern date back to Fenton’s earliest days? 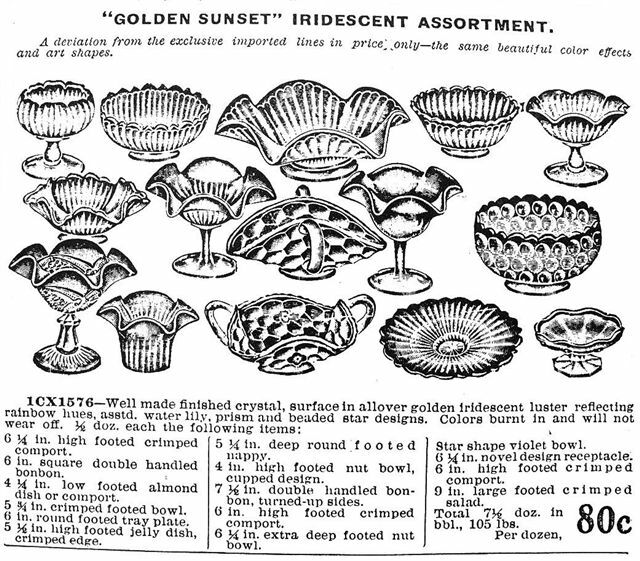 The “rare-so-what” Finecut Flower compote is shown on the bottom left corner of this 1909 Ad, and is nearly as obscure in today’s market as Priscilla and Honeycomb and Clover patterns. HONEYCOMB and CLOVER: in any shape is certainly not seen often! It is a great example of a John Resnik “rare-so-what”! An exterior pattern, just as Priscilla, the interior has no pattern. Bonbons are usually this shade of green. 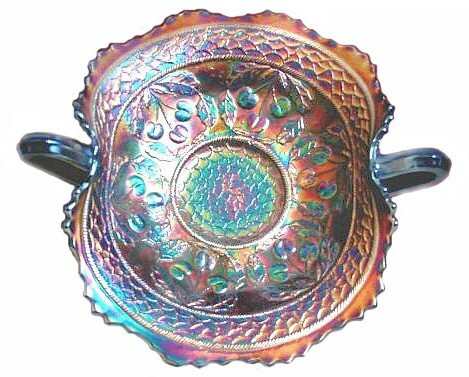 There is a marigold spooner in the pattern. Also applied as an exterior for Feathered Serpent and Pebbles patterns. Right: - ATLANTIC CITY Bell only partially iridized. 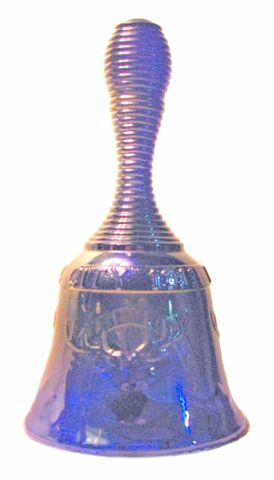 ATLANTIC CITY Bell: When Larry Greiner sent these photos, explaining that he had taken the bell to Frank M. Fenton for assessment, only to have Frank say he could not understand how the handle could be so thoroughly iridized and yet the bell portion is not covered with metallic spray, they both decided that Larry’s example could possibly be the only one like that. The portion on the upper handle indicates that it was “snapped up” for the spraying process, (note the pinched area) but perhaps there was not enough in the sprayer to do the job, or maybe it was time for lunch break? Another un-solved mystery! LITTLE FLOWERS Berry Set in Green. LITTLE FLOWERS 6 in. Sauce in Blue. 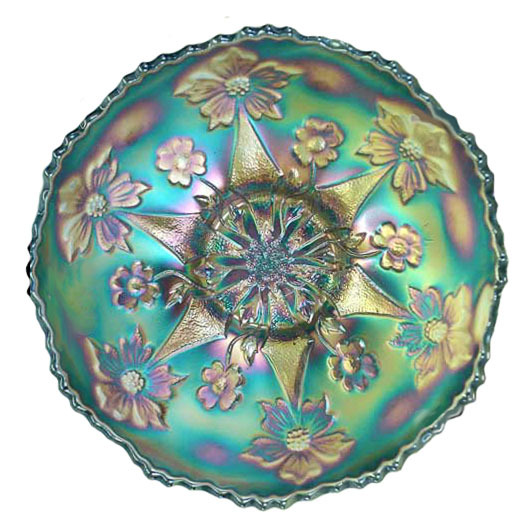 LITTLE FLOWERS Sauce in Amethyst - 5.75 in. diameter. LITTLE FLOWERS: To find a complete berry set in any pattern is a rare occurrence. This green set is exceptionally nice. 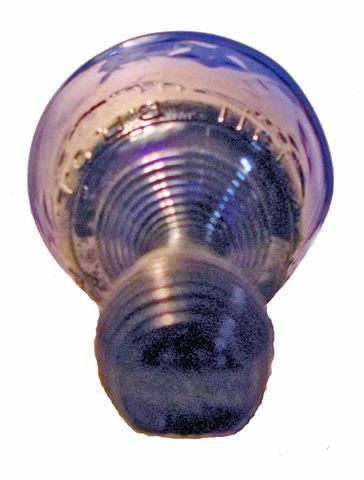 Both the cobalt blue and amethyst small sauces have been somewhat flattened from the usual berry shape, but not so much so that they can be called plates. 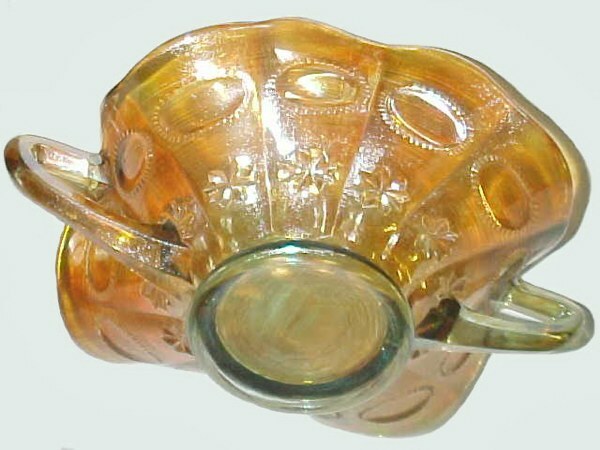 Marigold is another color in this pattern. 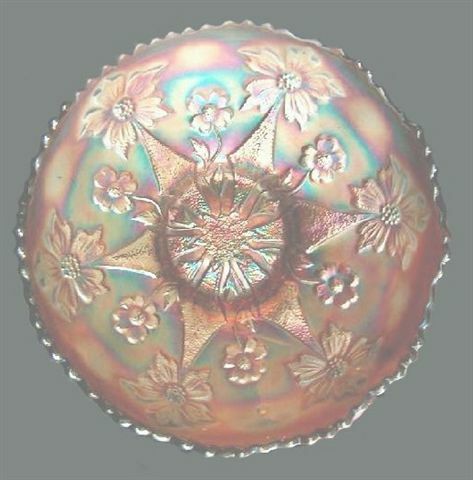 Rarely are they found flattened into a 10” chop plate and a 6” small plate, each from the berry set shape. CHERRY CIRCLES Bonbon in Amethyst, 9.5 in. long. 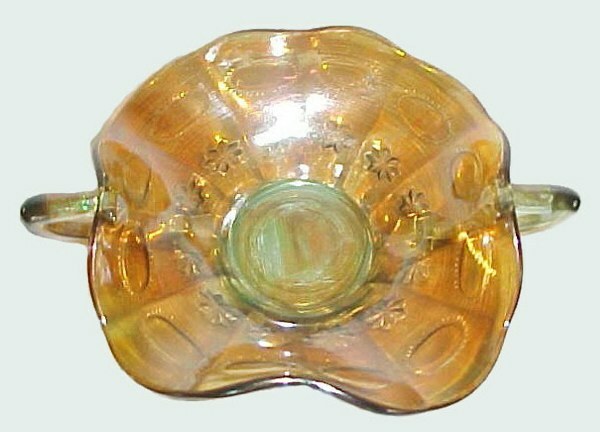 CHERRY CIRCLES Bonbon - Marigold 10 inch handle-handle. CHERRY CIRCLES Bonbon: Amethyst, aqua, blue, marigold and red are the basic colors found in this bonbon. 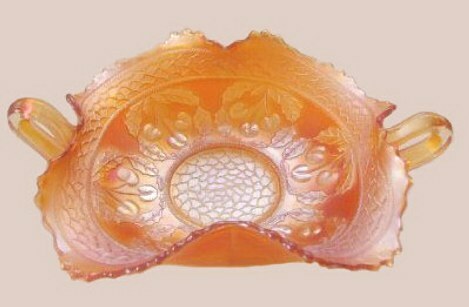 The pattern is used exclusively on this one shape. You may click on - - in our pattern alphabet for a look at a lovely red example.